The eight and one-half feet tall statue depicts King with his right hand raised as if giving a speech. He is standing behind and reaching over a balustrade with a set of opened shackles at his feet. The statue stands on a two feet high platform made of brick and black granite with quotations from King’s speeches incised into the granite. This platform rests on a large oval patio of brick and concrete. Running in a larger oval towards the street are broad sidewalks. An area near the sidewalk is covered with memorial brick pavers. Several reviews noted the symbolism of the sculpture, i.e. Dr. Martin Luther King, Jr. was a master orator and thus shown speaking to the public. The balustrade in front of King represents the barrier of inequality but is curved to show him pushing against those inequalities. 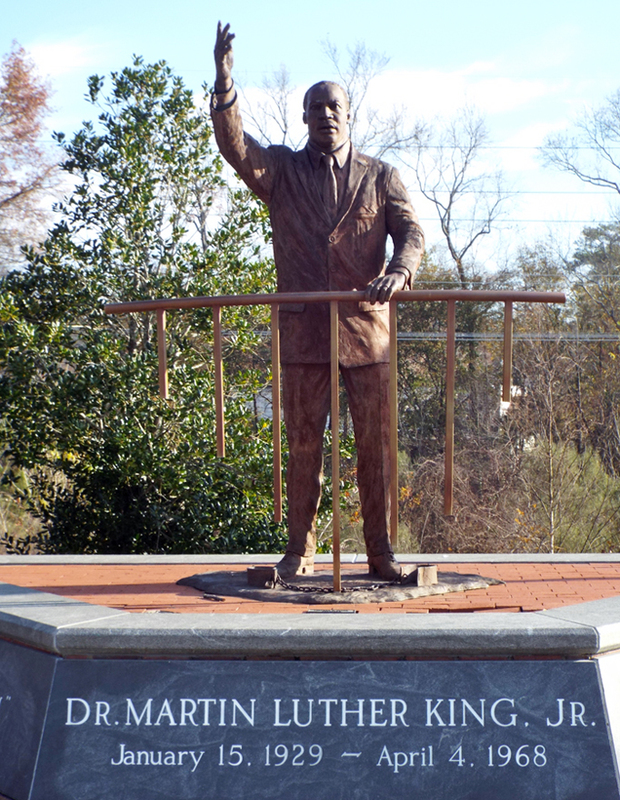 His arm reaching over and beyond the barrier symbolizes that equality can be possible. The balustrade’s simple design represents the times he was jailed for his beliefs and the sacrifices he made for the freedom of others. That sacrifice is exemplified in the baluster’s main support having broken the shackles of oppression. Left side below sculpture: "I HAVE A DREAM"
Granite wall right outer inscription: “LET US NOT SEEK TO SATISFY OUR THIRST FOR FREEDOM BY / DRINKING FROM THE CUP OF BITTERNESS AND HATRED. WE / MUST FOREVER CONDUCT OUR STRUGGLE ON THE HIGH PLAIN / OF DIGNITY AND DISCIPLINE.” / “I HAVE A DREAM” AUGUST 28, 1963 / LINCOLN MEMORIAL, WASHINGTON, DC. The sculptor Stephen H. Smith, a graduate of the University of North Carolina, also created the statue of Benjamin N. Duke that stands on a pedestal on Duke University's East Campus, First Flight Centennial Memorial in Kill Devil Hills, 65th General Hospital Memorial at Duke Hospital in Durham, and the James K. Polk statue in the rotunda of the Morehead Planetarium on the University of North Carolina campus. Some in the African American community were upset the statue did not look enough like Martin Luther King, Jr. Its likeness was compared more to that of actor Danny Glover than King’s and there were some calls for its removal. The sculptor was white and one observer likened the shackles at the statues feet as more representative of keeping King “in his place” and him not being truly free than what the sculptor said was the intent. 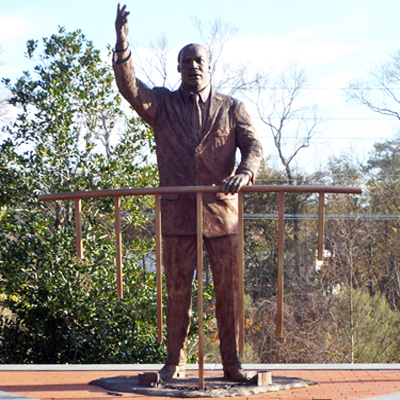 The statue is located at 739 Blue Street in Fayetteville, NC, next to a proposed park site to honor Dr. King. Candle light vigils are held annually on the eve of the Martin Luther King holiday.